An exceptional painter, graphic artist, and sculptor; born 1852, died 1936. His work continues to generate tremendous interest and is by some considered among the most outstanding art to be created in Poland at the turn of the 19th and 20th centuries. Between 1869 and 1875 Wyczółkowski was a student of the Drawing Classes of Wojciech Gerson in Warsaw. He continued his education in Munich under Aleksander Wagner and between 1877 and 1879 was a student of Jan Matejko at Krakow's School of Fine Arts. Wyczółkowski went on to be professor at the Academy of Fine Arts in Krakow and in the 30's headed the graphic design faculty at the School of Fine Arts in Warsaw. 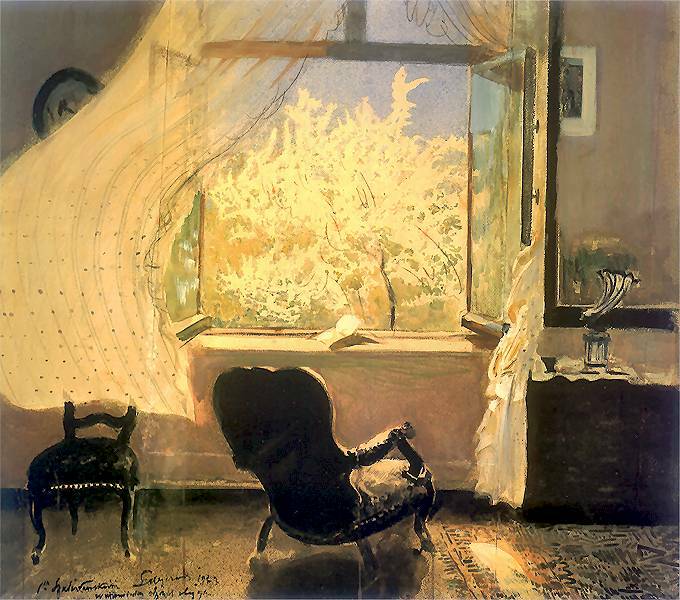 He was the co-founder and member of the Sztuka / Art Society of Polish Artists and received numerous awards and distinctions throughout his career. He was one of Poland's best graphic artists, achieving unparalleled mastery of the technique of lithography. Initially his compositions were romantic and historical in subject matter. The voyage he took to Paris in 1889 proved especially important to Wyczółkowski, as it was on this occasion that he was exposed to the work of the Impressionists. As a result, the artist became deeply interested in matters of light and color, and he shifted his focus to seeking out the lighting effects he could achieve in his paintings. It was at this time that he created some of his best works, including Orka na Ukrainie / Plowing in Ukraine (1892), Kopanie burakow / Digging for Beats (1893), Gra w krokieta / A Game of Croquet (1895), and his series titled Glowy rybaka / Fisherman's Heads, consisting of over 30 works. Wyczolkowski's style changed after 1900. He began to paint vast numbers of landscapes (including monumental views of the Tatra Mountains), portraits, genre scenes, still lifes, flowers, cityscapes, and views of artistic and historical monuments. His paintings additionally manifest a highly emotional attitude towards nature and the theme of the family. Wyczolkowski's vast output as a graphic artist is essentially unparalleled in Polish art as he constantly sought out and experimented with new printing methods. He was able to achieve highly subtle visual effects in various techniques, using white and black to extract delicate, even impressionistic nuances of light. He published his prints in a series of thematic portfolios, which include Tatry / The Tatras (1906), Teka litewska / Lithuanian Portfolio (1907), Gdansk (1909), Teka huculska / East Carpathian Portfolio (1910), Wawel (1911-12), and Stara Warszawa / Old Warsaw (1916).